There's an old saying in astronomy: "Galaxies are like people. They're only normal until you get to know them." That view is supported by a group of astronomers after using NASA's Hubble Space Telescope to study a large number of galaxies in our cosmic backyard. The detailed survey, called the ACS Nearby Galaxy Survey Treasury (ANGST) program, observed roughly 14 million stars in 69 galaxies. The survey explored a region called the "Local Volume," and the galaxy distances ranged from 6.5 million light-years to 13 million light-years from Earth. The Local Volume resides beyond the Local Group of galaxies, an even nearer collection of a few dozen galaxies within about 3 million light-years of our Milky Way Galaxy. A typical galaxy contains billions of stars but looks "smooth" when viewed through a telescope, because the stars are blurred together. In contrast, the galaxies in the new survey are close enough to Earth that the sharp "eyes" of Hubble's Advanced Camera for Surveys and Wide Field Planetary Camera 2 can resolve their brightest individual stars. By measuring the brightness and colors of these stars, scientists can derive the local history of star formation within a galaxy and can tease out subtle features in a galaxy's shape. "Past Hubble observations of the local neighborhood have provided dramatic insights into the star-formation histories of individual galaxies, but the number of galaxies studied in detail has been rather small," said Julianne Dalcanton of the University of Washington in Seattle and leader of the ANGST survey. The survey's results were submitted to The Astrophysical Journal Supplement Series. Another paper that details the star-formation history in galaxy M81 has been submitted to The Astronomical Journal. "Instead of picking and choosing particular galaxies to study, our survey will be complete by virtue of looking at 'all' the galaxies in the region. 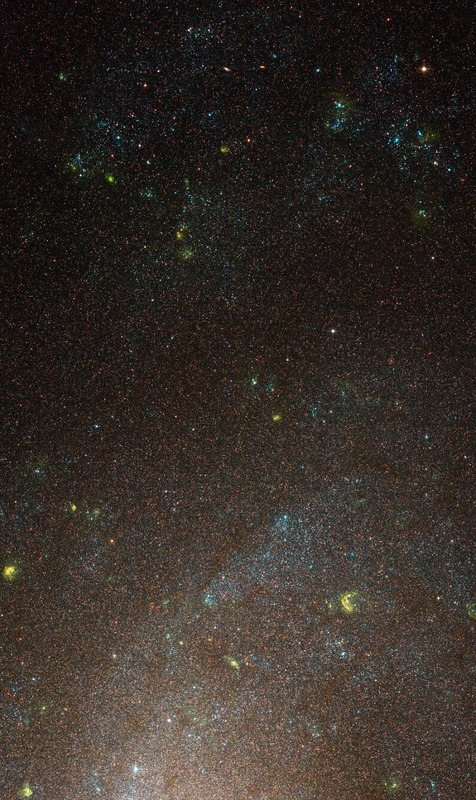 This gives us a multi-color picture of when and where all the stars in the local universe formed." Many stars in nearby galaxies are the fossil equivalents of the active star formation seen in galaxies in the distant universe. "When we look back in time at distant, young galaxies, we see lots of vigorous star formation. However, we can only guess as to what those galaxies might eventually turn into," Dalcanton explained. "Using the galaxies in the nearby universe as a 'fossil record,' we can compare them with young galaxies far away. This comparison gives us a history of star formation and provides a better understanding of the masses, structures, and environments of the galaxies." Early results of the ANGST survey show the rich diversity of galaxies. Some galaxies are made up entirely of ancient stars, while others have been forming stars nearly continuously during their whole lives. There are even a few examples of galaxies that have only started forming stars in the recent past. "With these images, we can see what makes each galaxy unique," said team member Benjamin Williams of the University of Washington. "When we look at the distribution and development of stars in each survey galaxy, we can learn how differences in the galaxies' histories have produced the diversity of galaxy shapes and colors." The ANGST survey also includes maps of many large galaxies, including M81. "With these maps, we can track when the different parts of the galaxy formed," explained Evan Skillman of the University of Minnesota, describing work by students Dan Weisz of the University of Minnesota and Stephanie Gogarten of the University of Washington. In a separate paper describing the star-formation history in M81, astronomers confirmed that massive spiral galaxies formed most of their stars in the early universe. Analyzing M81's outer disk, the astronomers found that most of the stars formed more than 7 billion years ago, when the universe was half its present age. M81 and other mammoth galaxies also experienced rapid enrichment of heavy elements, such as carbon, through the deaths of massive stars in supernova explosions. "We were surprised by how quickly the elements formed and how the subsequent star-formation rate for the bulk of the stars in M81 changed after that," said Williams, the paper's lead author.